Hiking up and out of Escalante Creek. Woke up and got going as early as I could. My goal was Tanner Beach, and that would be a 10.5-mile hike, across the most rugged terrain of my trip, so far. It would also be the hottest day of my 2-week journey, across the appropriately named Furnace Flats section, below the Unkar Overlook. Yay me. The morning started out, as usual, a quick breakfast, pack up, hit the trail and enjoy the morning shade as long as it would last. 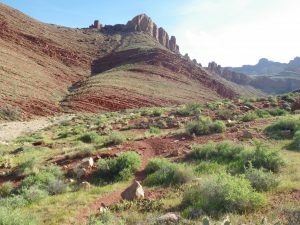 The first mile, or so, of trail wound it’s way along the lower end of Escalante Creek (a dry wash) and began to ascend up on to the ridge, immediately north of the drainage just as the sun devoured the last of the shade. Perfect timing. The route is easy enough to see/follow. It is narrow and sloping in many places, so careful footwork is required. I just kept up with my “…get there when you get there.” mantra, and listened to the theme song from “The Great Escape” play itself over, and over again in my head. PLEASE! Someone change the record! I stopped for a quick snack on the crest of the ridge and took in the view. It never gets old, looking around in the canyon. I also found my first tick of the season, and the second tick I’ve ever seen down here. I noticed it scurrying up my pant leg as I stood up to put on my pack. I gave it a good thump and sent it over the edge. Not today, my friend. Not today. From that point, I just continued on around and out onto the ridge overlooking the Unkar area. The “hilltop ruin” is located a short way off, and is worth a visit. The views from the structure are amazing. So is the ancient finger of gravel bar it’s perched on! The next leg of my hike was spread out below me – Furnace Flats, Cardenas Creek, and heat waves, visibly radiating up from all of it. I can’t imagine what this place would be like in July. I don’t really want to. I’ll stick to spring. 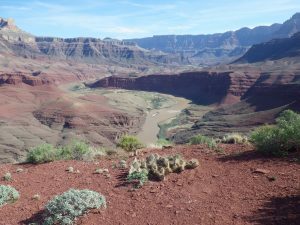 The trail from the Unkar Overlook winds down to the sandy flats by Cardenas. I walked down to the river, ate lunch in the shade, by the beach and found a 1/2 full bottle of sunscreen! Perfect timing, this find, as my little stash was empty and I was starting to pink-up on my shoulders. Thank you, unknown person, for the extra UV protection AND moisturizer, thank you. I checked my water supply and decided I had enough to make it to Tanner. Time to move on, it would only get hotter as the day wore on. The trail leads away from Cardenas Beach, winds through the sand dunes, past several well camouflaged prehistoric sites, and strikes out across the dark brown/black gravel covered “Furnace Flats.” The ambient temperature was around 80 that afternoon, and it felt about 20 degrees warmer. By the time I crossed out of the Cardenas Use Area and entered the Tanner area, I still had a mile or so to go, and I was sucking air out of my hydration bladder. Mercifully, the distance went by quickly and I got to Tanner between 2:30 and 3:00 without feeling too miserable. I snagged my favorite campsite, at the west end of the area, under some junipers, with a rocky beach. My first chore was collecting and filtering, and drinking water. This would be my last afternoon/evening at the river (on this trip) and I set up my sunshade, rinsed off in the river and enjoyed being there. By dusk, I realized I had the entire area to myself. 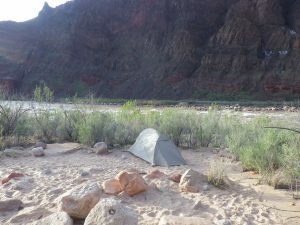 I walked up river to the little ledges campsite on the other side of Tanner Creek, and, no one. I was the only human at the mouth of Tanner Canyon. Well, it should be a very quiet night. The day would turn out to be my last in the canyon, for this trip. My original plan called for tanking up with enough water to hike up to a dry campsite, above the Red Wall. It would mean carrying extra water weight for the day, but I would have a shorter hike today, and a really short hike the next day. I was up and out of Tanner by 8:05 am and had a shady hike for the first 90 minutes. At 9:30 the sun rose above the canyon rim and there was no ducking it. The trek across the Dox is hot, and a bit tedious – it seems to go on forever. Once you’ve ascended above this, the trail steepens and you get fewer flat sections to catch your breath on. There are a few little places, here and there, to rest in patches of shade, and I took advantage whenever I could. Before I knew it, I was at the break in the Red Wall and could see my destination for the day – just up there. I topped out on the Red Wall at 12:30, ate a handful of cashews and then started down the trail to my intended campsite. 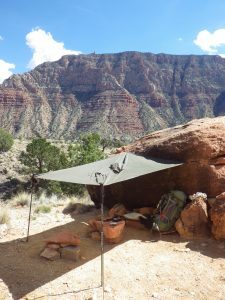 I looked out from my tarp, just as a gust of wind whipped up a dust devil. Large, dark clouds had started building up on three sides. By this point, I had no idea what the weather forecast was. The bulletin board at Indian Garden had a 4-day forecast posted there, but that was 7 days ago. 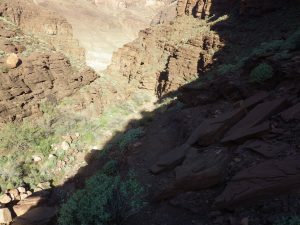 What was blowing in, and would it impede my hike out, up the friction slabs at the top of the trail? It was about 2 pm, so I decided to give it an hour, and see what happened. By 3:00 the clouds were beginning to consolidate and the wind was increasing. It was decided: Take enough water to hike out, put on the dry socks and head for the top. It would make for a long, steep day, but I wouldn’t have to navigate potentially wet slick rock slabs at the top. Besides, a beer and cheeseburger suddenly sounded pretty good. The only potential issue, aside from how tiring I knew it would be, was finding a place to stay that night. 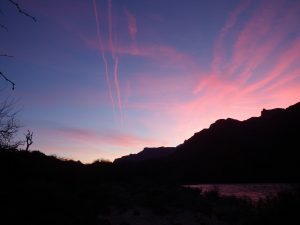 I had a campsite at Mather CG reserved for the next night and had nothing planned for an early exit. I also wanted to try and get out and to the Village by 8:00 – a hot shower would really be a treat, and they close at 8:00. I drank a liter of water, ate the last of my chocolate and cashews, laced up my boots and started out. I got up to Stegosaurus Rocks and met a couple resting after their hike down. He said the weather forecast didn’t look bad, but the buildup and wind hadn’t been predicted. I bid them farewell and kept hiking. From that point, the hike out isn’t too terrible. 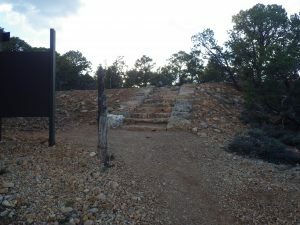 There are a couple of loose, steep sections (where have I heard that before) and, where the trail crosses through the drainage, large sandstone steps that trail crews have constructed. After ascending the Coconino formation, you start a series of switchbacks that wind through the trees. 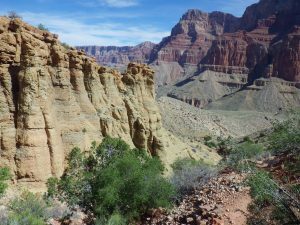 At the bottom of the Kaibab formation, you’re in the forest and the temperatures are significantly lower that what you’ve been used to. I zipped my pant legs back on and kept going. 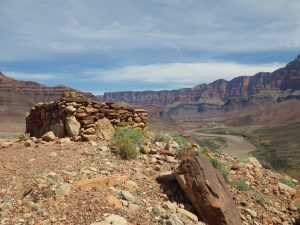 At 6:00 pm, 2.5 hours after leaving my little site below the Tower, I came to a set of stone steps that climb up, and abruptly end at the edge of the paved road leading to Lipan Point Overlook. And, with that, I was done. 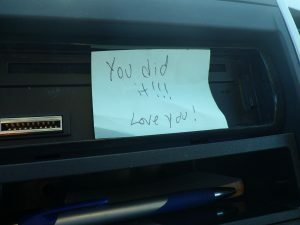 I walked the short distance down to my truck, found a note from my wife on the dash, and thanked the canyon gods when the engine turned over without any hesitation. 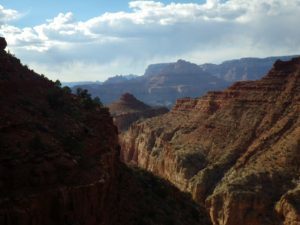 I drove into the Village, and immediately found the campgrounds booked up for the night, “NO VACANCY!” I then headed to the rim and went into the lobby of the El Tovar – the rim’s fanciest accommodation. They also have access to any available rooms at the other hotels. As it turns out, the only room available, on the South Rim, that night, was in the El Tovar and they offered me a ridiculous deal on it, despite how I looked and smelled. The receptionist was actually quite excited to hear about my trip, and when I told him how long I’d been out, he took another $50 off the price of the room. Nice people, those folks at Xanterra. I took the longest hot shower I’ve ever taken, well, not too long. It is the desert, after all. You don’t appreciate hot water and soap until you have been rinsing off in 50 degree, silty, chocolate water for days. It was at this point that I noticed my tan. I’d spent time at the beach in my climbing bra, burned through my long sleeved shirt on the trail, had pinked up around my pack straps, had worn my pant legs rolled up, or zipped off, been barefoot, worn my boots with my shorts. It all made for some interesting “topo lines” on my skin. Think “pink zebra.” After my shower, I found a cheeseburger, salad, ice-cold IPA and phoned home. 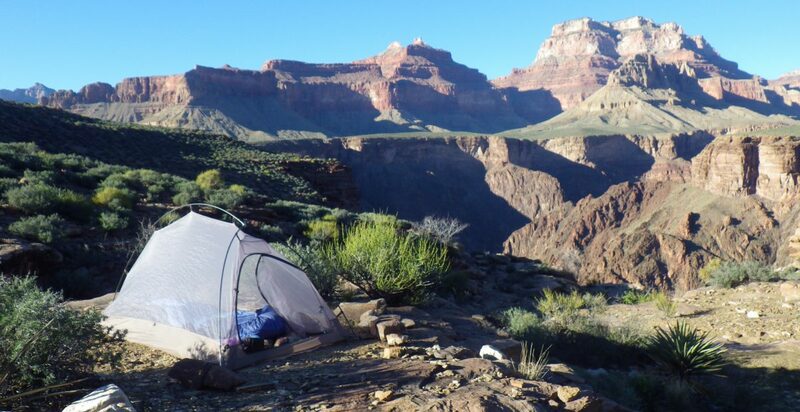 Usually, I find myself feeling down at the end of a backpacking trip. I put time into planning them and anticipating them, and then they’re done and behind me and I feel somehow disappointed, for lack of a better word. I haven’t experienced that this time, yet. I put more planning and effort into this trip, than usual. 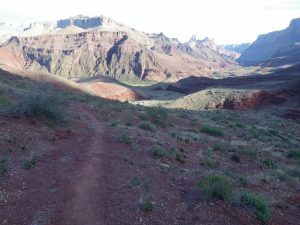 It’s the longest solo hike I’ve ever done, the longest number of days I’ve put in on a backpacking trip – period. I wasn’t afraid at any time, leading up to or during, that I wouldn’t be able to do it. My only real concern was how I’d do being along with my head for ten days. I’ve never done that before. Prior to the trip, that sounded like a lot. Looking back, it wasn’t much. I was in shape for it. I had prepared materially for it. The only equipment failure I had was a blown tent zipper (no biggie). I had worried about what it would feel like when I would catch site of the Tanner Trailhead, my endpoint. Would it be sad, would I feel disappointed that it was over? As the signboard at the top of the Tanner came into view, I didn’t experience any of that. I understood there, that I had taken this on for my own reason, to do the thing. Not how many miles I would cover in total, how fast I would do it, how “burly” it would be, what would my time be when I set my trekking pole tips at the trails’ end? My goal/reward/project was to go through the experience of the whole thing. That was it. All along, I’d been telling myself that I would get there when I get there. Well, I was here. Getting here was just part of the package. I had been rewarding myself the entire way, by just “doing the thing,” by just getting to know myself in this remote, rugged, potentially lethal, spectacularly beautiful place. It’s wasn’t the PCT, AT, or someone else’s “epic” journey. It was my journey, that I planned and executed and thoroughly enjoyed from start to finish. I think I’ll be able to ride the high for awhile, then I’ll head out on the next one.